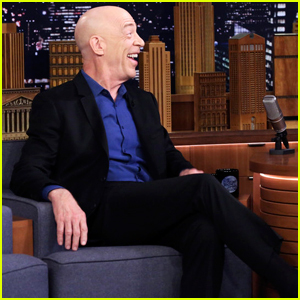 J.K. Simmons hit Jimmy Fallon‘s chair on The Tonight Show on Thursday night (December 6) and talked about being anointed the 50th King of Bacchus for Mardi Gras. J.K. also talked about about his most recognizable roles, like Farmers Insurance commercials, being directed by his wife in I’m Not Here, and dishes about acting opposite himself for his hit Starz series Counterpart – Watch more after the cut! Hugh Jackman suits up for a screening of National Geographic Documentary Films’ Free Solo! The 50-year-old The Greatest Showman actor hosted the event held at the Walter Reade Theater on Wednesday (December 5) in New York City. 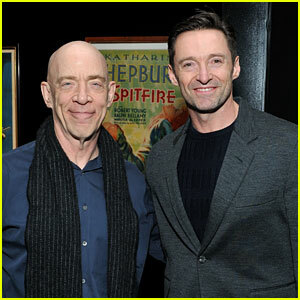 He was joined by his The Front Runner co-star J. K. Simmons. Also in attendance were climber/director Jimmy Chin, director Elizabeth Chai Vasarhelyi, and climber Alex Honnold. Free Solo follows Alex as he becomes the first person to ever free solo climb Yosemite’s 3,000ft high El Capitan Wall. With no ropes or safety gear, he completed arguably the greatest feat in rock climbing history. ICYMI, watch Hugh give fans a preview of his upcoming world tour with a performance of “The Greatest Show” live on Today. 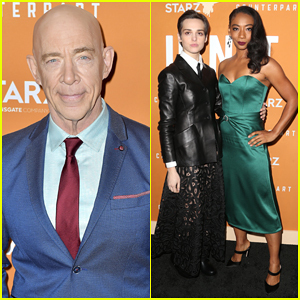 J.K. Simmons & 'Counterpart' Cast Celebrate Season Two Premiere - Watch Trailer! J. K. Simmons is dapper in a suit while hitting the carpet at the season two premiere of his hit show Counterpart held at the ArcLight Hollywood on Monday (December 3) in Los Angeles. 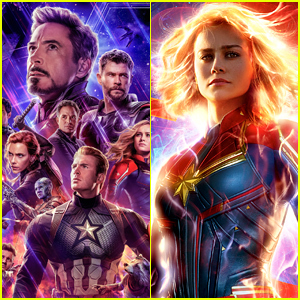 The 63-year-old actor was joined at the event by his co-stars Sara Serraiocco, Betty Gabriel, Harry Lloyd, Christiane Paul, Nazanin Boniadi, Olivia Williams, Laura and Sarah Bellini, Lawrence and Gregory Zarian, as well as creator Justin Marks and producer-director Jordan Horowitz. Counterpart returns Sunday, December 9 on STARZ – Watch the trailer below! FYI: Nazanin is wearing a Jeffrey Dodd dress. Betty is wearing a Rhea Costa dress. Hugh Jackman Gives Teary Speech at Santa Barbara Film Festival Honor - Watch Here! Hugh Jackman happily hits the red carpet alongside his wife Deborra-lee Furness while attending the 2018 Santa Barbara International Film Festival at The Ritz-Carlton Bacara on Monday (November 19) in Goleta, Calif. The 50-year-old actor was also joined by his Front Runner director Jason Reitman and co-star J.K. Simmons who helped honor him with the Kirk Douglas Award at the ceremony. Hugh hit the stage and teared up while talking about his wife Deborra, saying she taught him that life is “not defined” by highlight reels, like the ones shown throughout the night’s tribute. J.K. Simmons & Nolan Gerard Funk Celebrate Season One Premiere of 'Counterpart' - Watch Trailer! J.K. Simmons suits up as he hits the carpet at the series premiere of his new show Counterpart held at Director’s Guild of America on Wednesday (January 10) in Los Angeles. 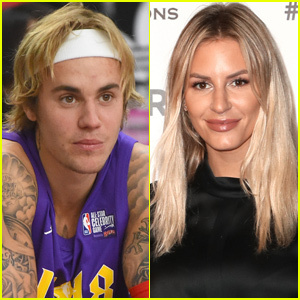 The 63-year-old actor was joined at the event by his co-stars Nolan Gerard Funk, Nazanin Boniadi, Sara Serraiocco, Nicholas Pinnock, Guy Burnet, Harry Lloyd, Mads Black, Junes Zahdi, Ilean Almaguer and producer Justin Britt-Gibson. In Counterpart, J.K. plays Howard Silk, a cog of a Berlin-based United Nations spy agency. Howard is thrust into a shadow world of intrigue and danger, where the only man he can trust is “Prime”. 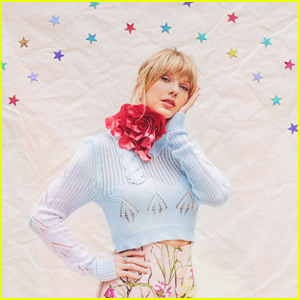 The show premieres on Starz on January 21 – Watch the trailer below! FYI: Nazanin is wearing an Elie Saab jumpsuit and Malone Souliers heels. 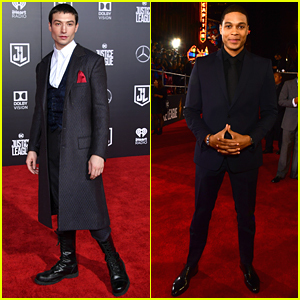 Ezra Miller and Ray Fisher dressed their best for the premiere of their highly anticipated movie Justice League! The actors – who will play The Flash and Cyborg, respectively – hit the red carpet at the event held at Dolby Theatre on Monday (November 13) in Hollywood. 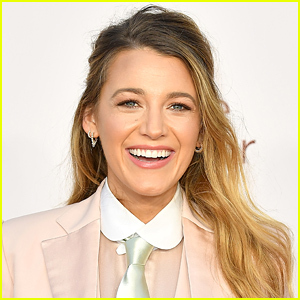 They were joined by their co-stars Diane Lane, J.K. Simmons, and Joe Morton. FYI: Ray is wearing a David Yurman ring. Diane is wearing a David Yurman ring.